Michael Thuné, winner of the 2017 Equal Opportunity Award, and Emma Tysk, Microsoft's IT-Girl for 2018. 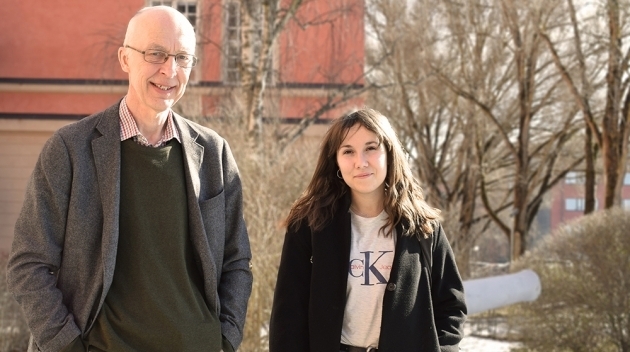 Michael Thuné, Head of Department and Professor of Scientific Computing at the Department of Information Technology, was recently awarded the 2017 Equal Opportunity Award from Uppsala University. In addition, Emma Tysk, a student with the Masters Programme in Computer and Information Engineering, has been appointed Microsoft's IT-Girl for 2018. Hi Emma and Michael, ​​we have to start by saying congratulations! How does it feel? EMMA: Thank you so much! It still feels pretty surreal, actually, it’s been less than a week since I received the price. But it feels really great. It must be great to be celebrated by such a large organization as Microsoft? EMMA: Yes, really, I had no idea I would win. The two girls I competed against were amazing and have been sources of inspiration for myself, so I felt this whole thing was "too big" in a way. What was the process like, were you nominated by someone? EMMA: Yes, I was nominated by a friend from Engineering Physics and from then on it just kept going. You were nominated in part because you have given lectures for high school students. Was that something you came up with yourself, why was this important to you? EMMA: Exactly. I started by visiting my former high school last year and in the near future I will hopefully give a lecture at Katerdralskolan. When I was in high school, I didn’t have any women in the IT industry to look up to, and now that I've gotten a bit further, I have seen that there’s still a shortage of female role models. So, I think there is a need for initiatives on that front. That's why I wanted to start lecturing: what you need is someone to relate to, someone to look up to, that can make an incredibly big difference. There are female role models in other research areas. When I went to primary school, I would hear about Marie Curie, but we were never told that the first programmer was a woman [Ada Lovelace; ed. note.]. I had to find that out for myself. So that's what I want to address in my lectures, if we have more female models, I think we will see more women take an interest in the IT industry. And congratulations to you too, Michael Thuné, who recently received the University's “Equal Opportunity” award. It must feel good when the department is doubly honored for its equality work, how is it that the Department of Information Technology is so committed to these kinds of efforts? MICHAEL: It’s a great feeling. The department’s work on gender equality and equal opportunity may in some ways stem from our underrepresentation of women. This creates an incentive to try to work on these issues, more so than if we’d been doing more “OK,” then maybe we’d be more laid back. But now that we have so few women we need to work hard to make sure those who are with us have a good working environment, while, of course, also recruiting more women to the department. What do you think the future looks like? Can initiatives from students like Emma make a difference? MICHAEL: I think these kinds of initiatives are very important. Also, all female applicants to the education programmes in Computer Science and Computer and Information Engineering are invited to visit us even before they have been accepted, just to show them what it is like to study here at ITC. The hope is that there will be a greater chance that they choose to study here if they get accepted to one of the programs. Our Q+ Assistants* run the project with support from our Equal Opportunity Group. All such initiatives are important exactly because – as Emma says – the more role models you can find in the place you want to be, the greater the chance that you can see yourself there too. And then it's very important that we provide good working conditions for everyone in place, no matter who you are. Otherwise people may choose to drop out. And Emma, from now on Microsoft will help you reach out to and lecture at more schools? EMMA: Precisely, we haven’t really worked through the details yet, but they have said they want to take part in and support my efforts. It will be great to have the support of Microsoft. I also want to work more with social media. I think it’s really important to spread this message to the platforms that young girls come into contact with. My basic idea is to lower the threshold and make it easier for younger women to get in touch with people in the industry. We have to take the first step by presenting them with information and pointing out the opportunities that the industry offers. * Q+ Assistants are students who work part-time for the education programs in Computer Science and Computer and Information Engineering at the Department of Information Technology. Q+ Assistants are responsible for a network of female students from the aforementioned programmes, and other female students in computer science and related subjects. Assignments vary, but their tasks include regular networking activities, recruitment activities such as visits to upper secondary schools or study fairs, and an active involvement in the institution's gender equality work [ed. note].